From left: Nona Thomas, William S. Hart, Gertrude Claire. Handwriting on the back of this lobby card reads: Triangle Film Co. / Thomas Ince / 5 Reels / March 24, 1916 / Directed by Wm. S. Hart / Cost $15,681 production. "The Apostle of Vengeance" is a Hatfield-vs.-McCoy story written by Monte M. Katterjohn where the family names are Hudson and McCoy. Today, the story seems about as sappy as a Hart film gets — and that's saying something. Hart is a Hudson, but he's also a preacher. One of the McCoys captures his sister and tries to have his way with her. Hart is expected to avenge the affrontery, but when the McCoy boy begs for his life, Hart the apostle spares it. Spoiler alert: Hart ends up marrying a McCoy, the families become fast friends, and all live happily ever after. The film was distributed by Triangle Film Corp.'s distribution arm, Triangle Distributing. S.A. Lynch was Stephen Andrew Lynch (Sept. 3, 1882 — Oct. 4, 1969), a onetime baseball standout from North Carolina who aggressively bought up so many movie theaters in the South in the 1910s that he was able to swing an exclusive distribution deal with Paramount (then a distributor, not a production company). In 1916 he bought into Triangle Distributing and sometimes branded its releases with his own company name. Read more about Lynch here. Around that time, Triangle started to unravel, and Lynch milked its product by re-cutting films that Triangle previously distributed and releasing them as new films. There are three reasons to think this lobby card is associated with a slightly later re-release of this film. One, it's the wrong date. Lynch started releasing earlier Triangle films in 1917, and this film originally came out in 1916. Two, the lobby card is the wrong size and paper stock for 1916. Lobby cards in the 1910s were 8x10 glossies. This is an 11x14 matte print on heavy, buff-colored stock. 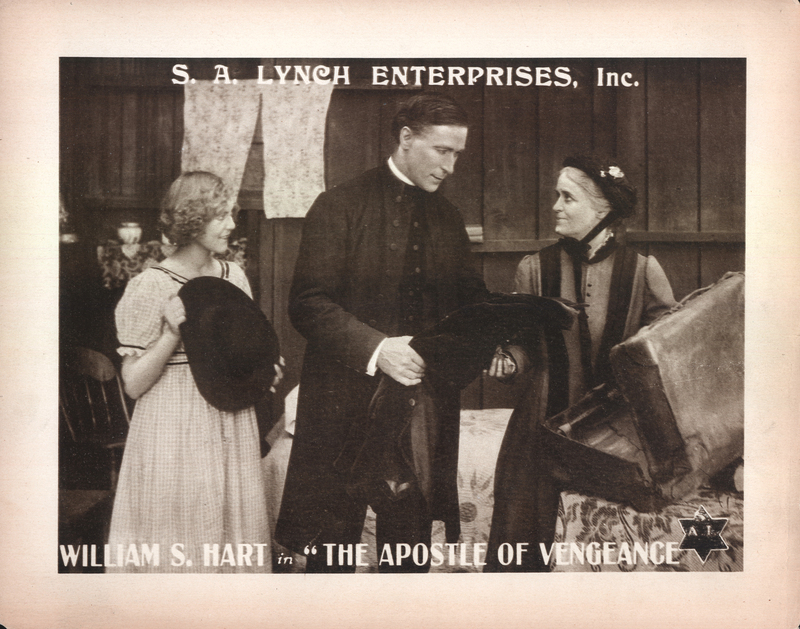 The 11x14 size and the buff-colored stock weren't used for lobby cards until 1919 or 1920. Judging from the relatively poor image quality, Lynch probably printed this 11x14-inch card off of an 8x10 print from the initial release. Three, the overprint. The thing that looks like a Star of David in the lower right-hand corner of this lobby card probably isn't. The original Triangle logo — an inverted triangle, pointy side down — is barely visible underneath the star, but it's there. The "star" is probably actually a sticker (or glued-on paper) with Lynch's logo, covering up the Triangle logo. The sticker was probably affixed to the 8x10 print, and then the photo-with-sticker was used as the master for printing the 11x14 cards. Lynch's logo was his intials, SAL, in a pyramidal layout, like a right-side-up triangle, with "Enterprises" below — as seen on a different lobby card with an SAL/Triangle overprint at right. "Enterprises" was probably printed beneath the intials on the sticker, but it's too dark to show up when reproduced. By now you're asking: So what? So ... by examining this one lobby card we can see that distributors and theater owners (which at the time were usually the same people) were making money off of Bill Hart films for years after the actor was paid his salary. There weren't any residuals and there wasn't much profit sharing in the early days of film. As for Lynch, after Triangle faded away, Paramount rose up as a major production house and Lynch became a key player for Paramount as the studios battled to buy and/or control movie theaters before the Federal Trade Commission charged him and others with racketeering and put a stop to it. Paramount paid him off for $5.7 million in 1922, but he returned to Paramount as an executive a decade later to help steer the bankrupt company through the Great Depression. 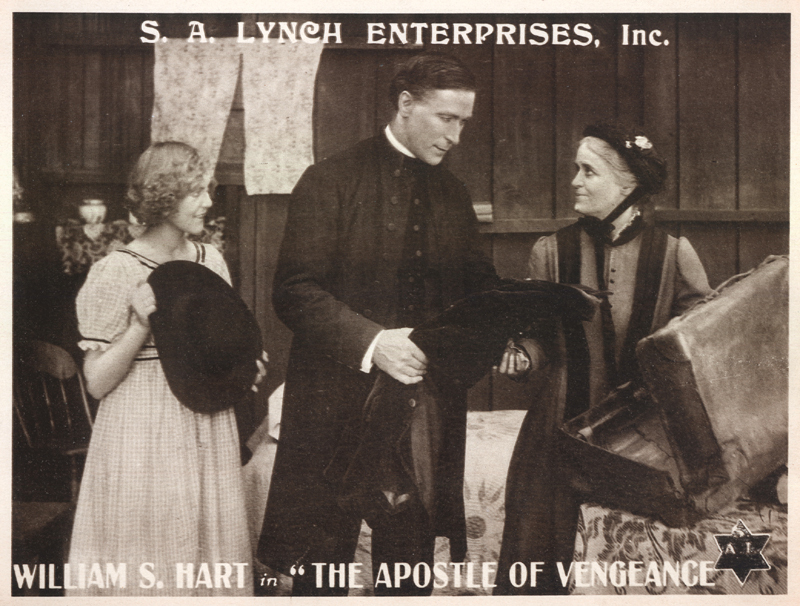 About "The Apostle of Vengeance"
LW2536: 19200 dpi jpeg from original lobby card purchased 2013 by Leon Worden.